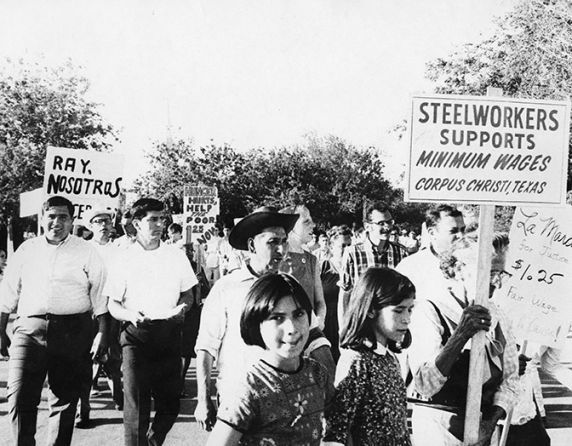 Join the Reuther Library on December 4 for a screening of Voices of the UFW in Texas, a new documentary detailing the 1966-1967 melon workers' strike and organizing drives in Texas over the next 4 decades. In 1966, farm workers harvesting melons in Starr County, Texas, made just 40 cents per hour. Inspired by the previous year's grape strikers in California, they began working with Eugene Nelson of the National Farm Workers Association to organize and fight for better conditions. The strike began June 1, 1966. On July 4, farm workers began a nearly 500 mile march across South Texas. When the group reached the State Capitol in Austin, Texas, 10,000 supporters joined them in solidarity for the last leg of their voyage. The march raised the consciousness of Tejanos and lit a spark that moved Chicanos to fight against the status quo. The strike continued in the summer of 1967, marked by renewed violent attacks from the Texas Rangers. The film includes interviews from workers and organizers who participated in the strikes as well as the UFW’s continuing struggle to organize in Texas. Mary Mecartney, a long-time UFW staff member, will be on hand to respond to comments and questions from the audience.